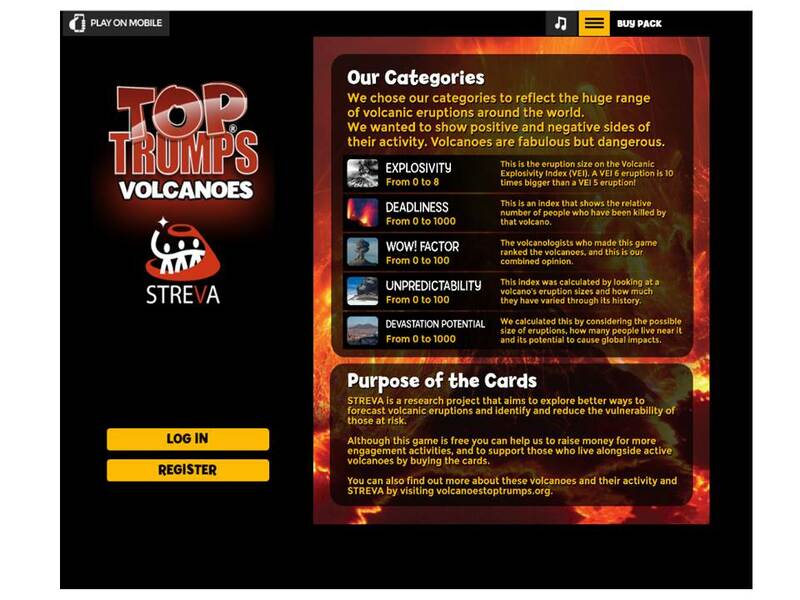 After some months of testing and refining, a free-t0-use online version of Volcanoes Top Trumps has been launched by Winning Moves. This should greatly extend the reach of Volcanoes Top Trumps – which is a fun and educational game about volcanoes that has spun off from the NERC – ESRC funded project ‘STREVA‘ – Strengthening Resilience in Volcanic Areas. Why not play the online game, and then let us know what you think of it! Volcanoes Top Trumps was created by scientists at the University of East Anglia, the University of Plymouth and the University of Oxford. There’s not much that beats the thrill of discovery.. particularly when it turns up in your own backyard. 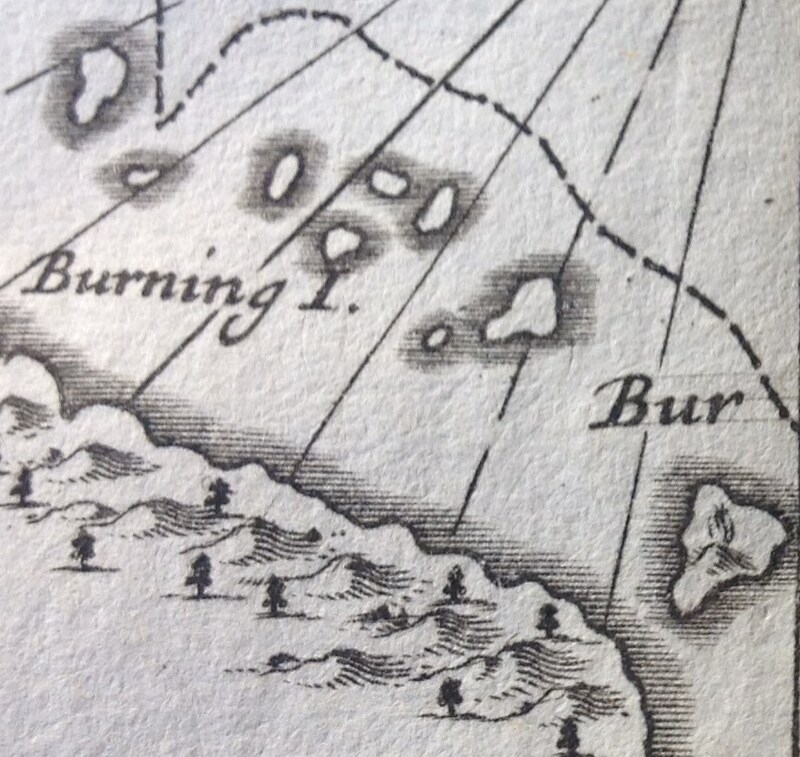 This summer, I have been on the hunt for records and reports of the 1902 eruptions of St Vincent, a lush volcanic island in the Eastern Caribbean. There are indeed many reports from this eruption, carefully documented in official records from the time. But, more surprisingly, there are samples – and many of them in the UK: packets, vials and boxes of ash; chunks of rock and more, in museum collections and archives in both the Natural History Museum, and at the British Geological Survey. Here is just a snapshot of some of the incredible samples from the British Geological Survey Archives. 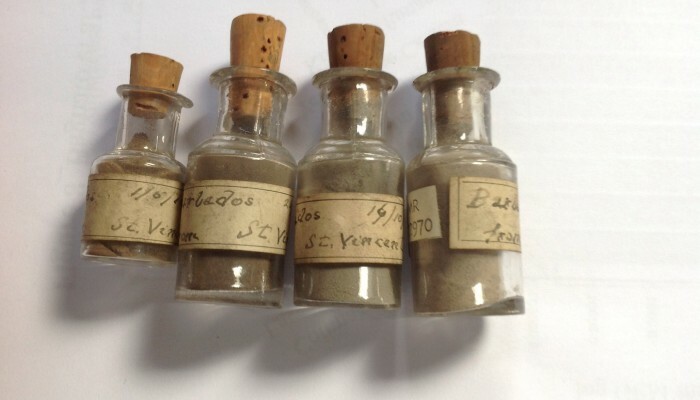 Four vials of volcanic ash – all collected on Barbados. The smallest vial is of ash from the 1812 eruption of St Vincent. 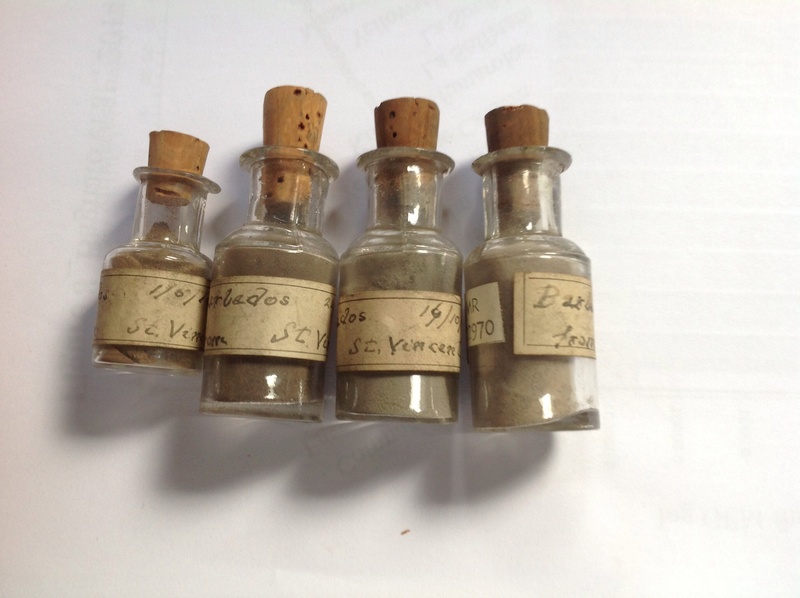 The three other vials are samples of ash that fell on Barbados during eruptions between May 1902 and March 1903. Along with the samples are the original envelopes in which they were sent, and handwritten notes documenting the sample: priceless tools, when you want to look back at an eruption that took place over 100 years ago. 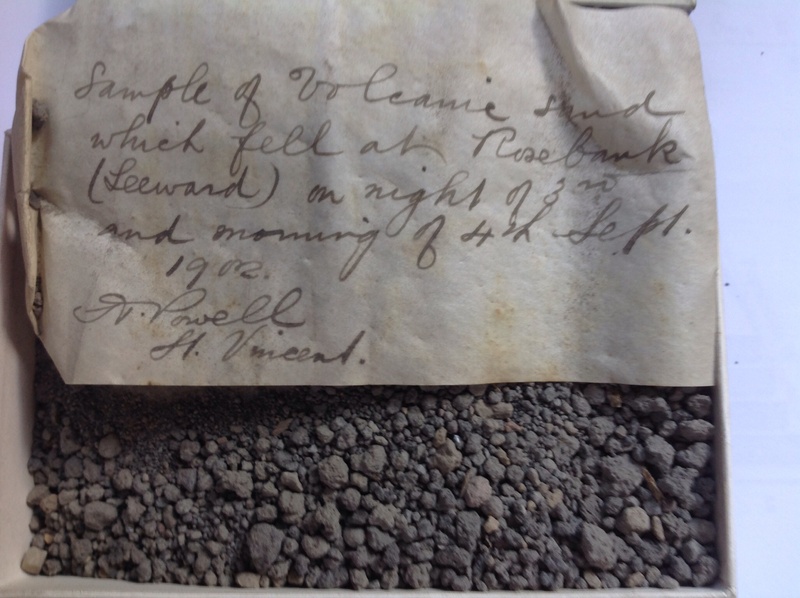 1902 Barbados ash sample sent to Horace Woodward, who was in charge of the Geological Survey’s office in Jermyn Street, London, at that time – which included the Museum of Practical Geology. 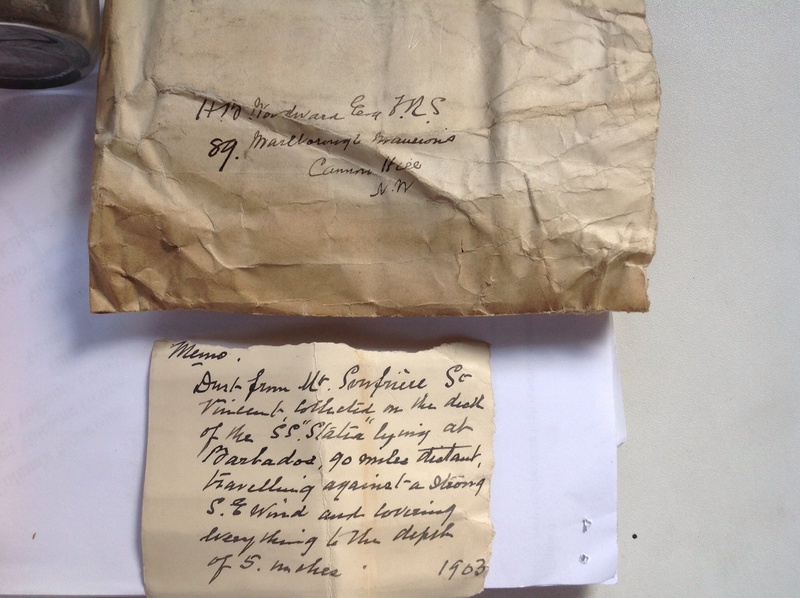 Memo reads ‘Dust from Mt Soufriere St Vincent, collected on the deck of the SS ‘Statia’ lying at Barbados, 90 miles distant, travelling against a strong S E wind and covering everything to the depth of 5 inches. 1903′. Some of these samples are timed and dated, and can be linked to particular phases of the eruption. Here is one example – of the ash that fell during the opening stages of the eruption on Barbados. 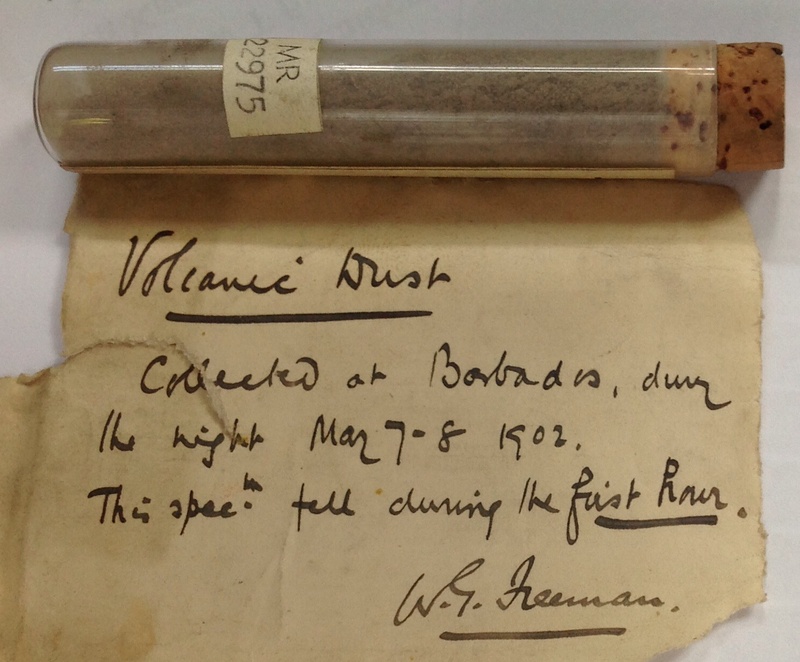 ‘Volcanic dust collected at Barbados during the night May 7-8 1902. This spec. fell during the first hour’. Collected by WG Freeman, a botanist at the Imperial Department of Agriculture for the West Indies in Barbados. Other samples can be used to map the distribution of ash and coarser samples that fell across St Vincent – here’s an example of a ‘gravel’ grade sample from Rosebank on St Vincent. 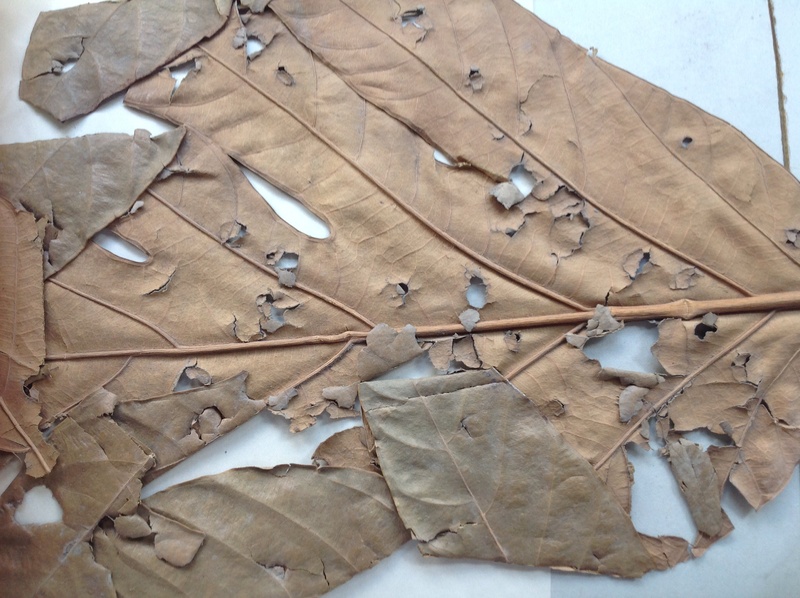 Among the most amazing discoveries, are examples of damage to economically valuable plants – this one, a sample of Breadfruit leaf that was damaged during the latter stages of the eruption in March 1903. ‘A leaf of the Bread Fruit Tree (Artocarpus incisa) gathered in St Vincent about 12 miles from the Soufriere and showing perforation caused by volcanic stones etc.’ Collected by WG Freeman in 1903. Together, these sorts of samples will allow us to go back and investigate what was actually happening during the eruption, in a way that is rarely possible, even for modern events. 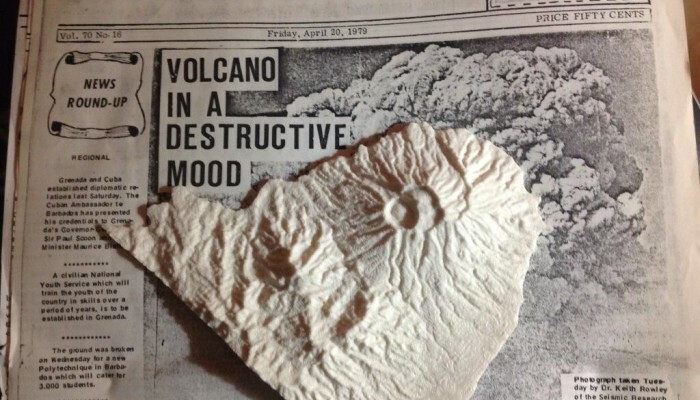 Links – read more about the eruptions of St Vincent on the London Volcano blog. Much of my time is consumed with reading, but it is almost always for a purpose: essays, assignments, proposals, drafts of papers, re-drafts of papers, papers for classes, for review.. This almost always means reading fast, with a goal: to measure, assess, hone, distil, critique and rewrite. Often, it means hacking through tangled and cumbersome layers of scientific prose, to reveal the central narrative. Then, for in a few days in midsummer, I get the chance to rediscover reading for pleasure: immersion in a book that grabs hold of your imagination and translates you to another place and another time. This year, my summer reading has got off to a cracking start with ‘H is for Hawk’. 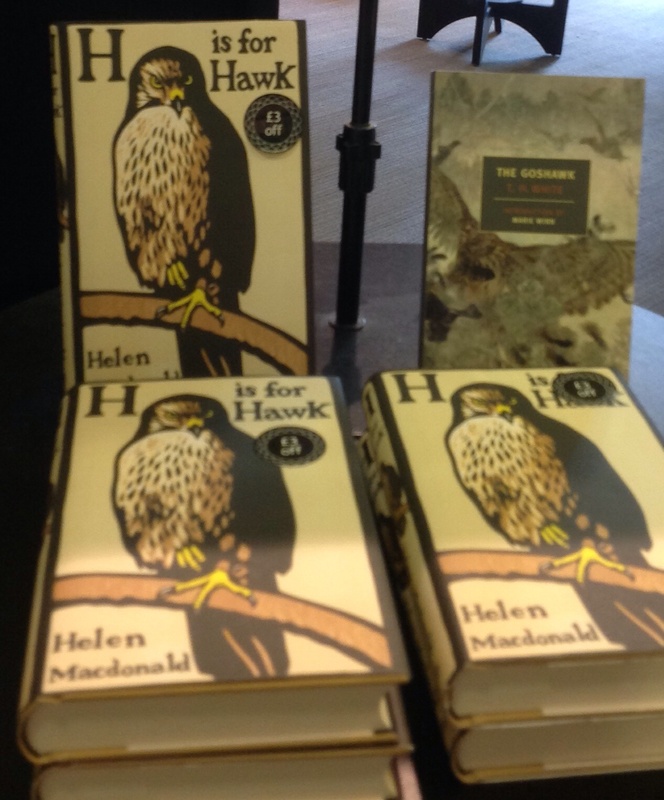 ‘H is for Hawk’, written by Helen Macdonald and published by Jonathan Cape, is a dizzying, dazzling read that defies its rather sober classification (‘Nature Writing/Biography’). The book weaves together a deeply personal story of grief and loss, with the rediscovery of life lived through the training of a young goshawk. In places, the staccato text crunches like the twigs strewn across a forest floor; in others, it soars like the circling hawk, magnificent, alert to the slightest movements below. It contains some wonderful writing on nature, capturing the very essence of the countryside in just a few words, alongside some moving reflections on bereavement and the way that death changes in a moment the lives of the living, and our relationships with what was present and is now past. In parallel, and wrapped up closely with the training of her young goshawk, Helen Macdonald explores the life and writing of TH White, a teacher and writer of Arthurian novels who wrote of his own struggle to train a goshawk in the 1930’s. The result is a book that works on several levels, and would reward re-reading: a beautiful and captivating read. Update – in November 2014, Helen Macdonald was awarded the 2014 Samuel Johnson Prize for ‘the best non fiction book published in the UK’ for H is for Hawk. Roseau Dry River, St Vincent, 1902. Photo by Tempest Anderson, published in his book Volcanic Studies in Many Lands (1903). Lahars are a very common feature at volcanoes, and they may often continue to be triggered by strong rainfall events for months or years after the eruptive activity has ceased. Tempest Anderson was an opthalmologist by profession, and also an inveterate traveller and photographer. 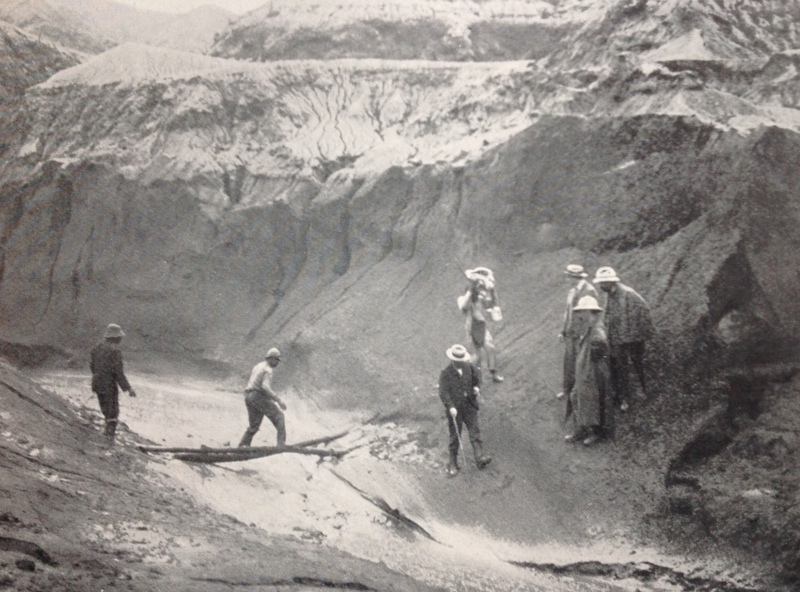 He accompanied John Flett to the Caribbean to document the eruptions on St Vincent and Martinique, in 1902, and a selection of his photographs can be found on the website of the Yorkshire Museum. The Soufrière of St Vincent is the centrepiece of the London Volcano project, which runs from 9-13 June. Anderson, T., Volcanic Studies in Many Lands, John Murray, 1903. Over on the Nature Methods blogs site, there are some interesting posts with advice for authors on how to prepare cover letters, rebuttal letters, appeal letters and the like. Here’s an example of ‘how NOT to write to an editor‘, based on a recent experience of mine. I shall let the author remain anonymous, but my hunch is that this is not an isolated example of this sort of behaviour, and I’d be interested to hear of any similar experiences. A while ago, I declined to send for review a paper which I was handling as editor. The paper was submitted as a Review Article but, as I explained to the author, the manuscript was not ready to be considered for publication since it was pretty much only a review of their own work, without proper reference to current work in the wider field. I suggested to the author that this would be something to address, and returned my decision through the usual journal manuscript-handling route. 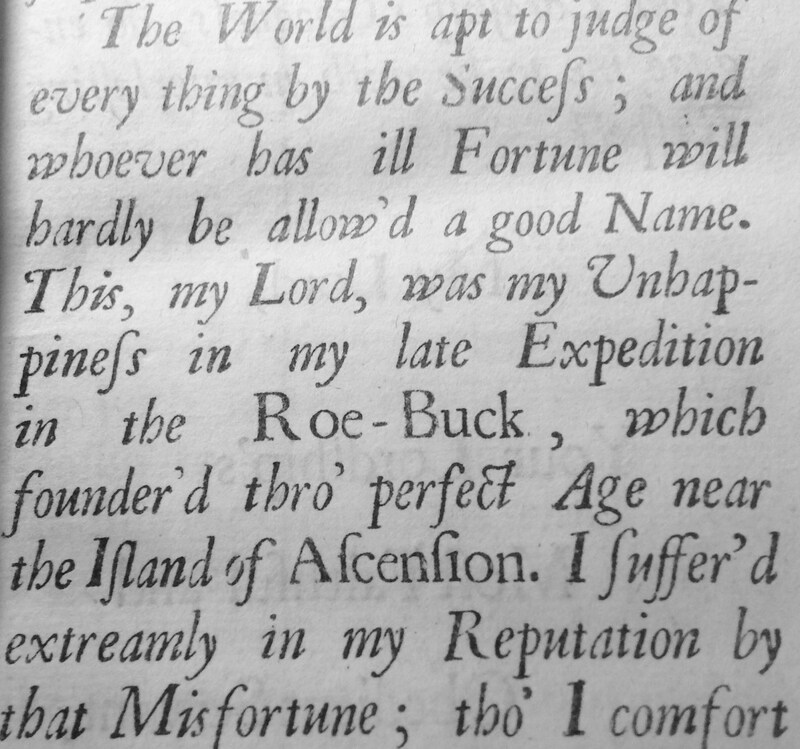 The author subsequently responded to the entire editorial body of the journal, before escalating their grievances further, and for this reason I regard their correspondence as public. Here is what happened next.. Response 1 from the author [edited]. I appreciate your efforts to provide a rather detailed explanation of the basis for your decision to decline publication of my manuscript. I would .. like to respond to some of your comments as I believe such a response might be helpful to you. I am the individual responsible for demonstrating the feasibility of this [hypothesis] and I have made almost all of the developments. That is simply a matter of historical fact. Those with the capability should have tried to refute the idea and, if unable to do so, the idea should be cited. When a malevolent, but influential, coterie decides to ignore a specific development, it places that coterie, and those who subscribe to that behavior, at risk. The risk is not being able to progress in science. You have no legitimate basis to expect [me] to cite or debate “recent work on the nature of [X]” as virtually all of the published work .. is based upon [an idea for which] there is no independent corroborating evidence. One does not progress in science by making models based upon assumptions, but rather by discovering fundamental quantitative relationships. Science is all about telling the truth. To say that I have failed to [cite recent work] is not correct, which makes me wonder about your underlying motivation for declining publication of this work. Sometimes it seems as if the geoscience community, especially Americans and more recently Europeans, try to avoid any mention of science that disagrees with their pet models. I have seen that behavior repeated over and over. In declining publication of the submitted manuscript, you aid and abet that behavior. Perhaps you are unaware that science progresses, not by arraying seemingly agreeing evidence, but by discovering inherent failures. To a large extent the geoscience community is playing at science, making nonsense models based upon assumptions, suppressing mention of real scientific advances, and patting each other on the back. Sadly, your behavior seems to doom the journal to be an organ of mediocrity. If you are unable to be a real scientist, why play at science? Since this response didn’t actually appeal the decision, I left it at that. Two weeks later, I received the following message from the author, copied to several senior staff in my University. Subject: Allegation of Misconduct and Academic Malfeasance..
[Over the years] most of my work has been intentionally ignored, subjected to misrepresentation, and often unwarrantedly suppressed, while the geoscience community wastes vast amounts of money making models based upon arbitrary assumptions in lieu of making discoveries. The matter at hand is about just such an incidence of unwarranted science suppression justified solely by false statements. Evidence is presented below to support the allegation that Pyle (1) aided and abetted a concerted effort to conceal from the scientific community, Government science-funding officials, and the general public, certain specified scientific advances, published in world-class journals, and (2) made a series of false statements to justify (1). One consequence of said alleged actions is to cheat those individuals and institutions, including taxpayers, whose monies support scientific research in areas adversely affected by said concealment. In the broader context, said allegations of unwarranted science suppression stand in contradiction to principles of academic integrity that should be the minimum expectation. [The] rejection decision without legitimate basis resembles and appears to become part of concerted efforts to suppress, conceal and misrepresent [my] published work… This is a pattern of activity which, I submit, has the consequence of defrauding those entities that fund scientific research. It is a pattern of activity that I believe should be investigated by authorities. I believe that it would be wrong either to ignore or to whitewash the present matter. I propose that .. Professor Pyle might consider making a concerted effort to counter said unwarranted ignoring, misrepresenting, and attempts at suppression of my work. For example, he might submit a Theme Issue proposal [to a journal on this topic]. He might write a review article for [a mainstream] journal. He [might] also organize a special session on the subject for [an international] meeting. Moreover, Professor Pyle might benefit through attaining a deeper understanding of geoscience and how to make important scientific discoveries. 1 – in most journals, the role of the editor *is* to make judgements about what to publish, and what not to publish. There is nothing malevolent about this – there is whole world of journals out there, in a competitive market place and authors are free to shop around to find the best place for their work. 2 – journals all have formal mechanisms for replying to editors, and asking for decisions to be reconsidered. The author made no attempt to explore any of these avenues before embarking on a completely irrelevant path of escalation. 3 – if you do wish to engage an editor, then perhaps best not to start off by being patronising; and certainly better not to engage in tactics that could be interpreted as harrassment, bullying or threatening behaviour. If people are ignoring your work, perhaps it’s not their fault, but yours? In any case, these protests about suppression of ideas are fatuous: at the time of submission, the paper was already available to read in ArXiv; and the day after receiving my decision, the author submitted a version of the paper to another journal, where it has since been published. A 3D printer model of the Soufriere of St Vincent, an active volcano in the southern Caribbean. We are now just three weeks away from the launch of an ambitious public engagement project – ‘London Volcano‘. This will see us build a large scale-model of volcano on the front lawn of London’s Natural History Museum. This activity is all part of Universities UK Week 2014, and our aim is to highlight the work we are doing on ‘Strengthening Resilience in Volcanic Areas’ in the STREVA project. 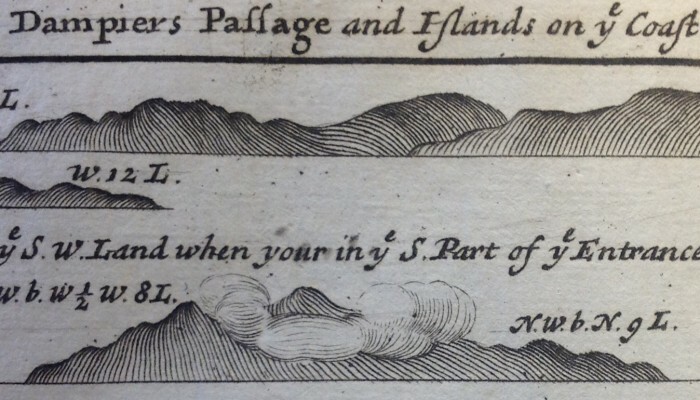 Here’s a short post from last week over on londonvolcano.com, describing an 18th century volcano simulation in Marylebone gardens. Follow @londonvolcano on Twitter to keep up with our progress!